Among Mid-Century furniture designers - that is, those working from the 1940s-60s, and even into the 1970s - the unofficial King and Queen of that era are Charles and Ray Eames, the California-based husband-and-wife team. Many Eames pieces have become so archetypical it's hard to believe they're collectible. They definitely are, as a major auction at the Wright auction house proved. Here are highlights from the 130-item event, held April 8, 2010 in Chicago. ...rectangle about to turn into an oval, the transformation being arrested at a point midway between. - American Furniture: 1620 to the Present. Another functional, contemporary touch: the visible shock mounts bolted to the frame. The ball-and-socket feet, on the other hand, are a traditional feature – one patented by Shaker craftsmen back in the 19th century. This chair fetched $813 at auction. Eames pieces were designed for easy mass production, composed of adaptable, interchangeable parts. Benefiting from developments in manufacturing techniques during World War II, they primarily used industrial materials, like plywood, lacquered masonite, laminate and zinc-plated steel, all of which are found in this storage cabinet. It went for $15,000 at auction. Originally intended just to be a prototype, this reclining lounge chair with ottoman became one of the Eames’ greatest hits. The rosewood plywood and leather seats impart a richness to the piece, which otherwise reflects the characteristically light look of their designs – in fact, the chair and ottoman almost seem to be floating in space, barely anchored by their aluminum swivel bases. They fetched $7,500 at auction. Made of a single piece of molded fiberglass, the shell armchair was another quintessential Eames design. Although it looks severe, it was actually carefully contoured to the shape of the human frame, for comfortable seating. Inheritors of the International style, the Eames were also pioneers of ergonomic design. Along with its armless counterpart, the bucket chair, the shell chair was designed to be stackable. This model – more lavish than the standard, with walnut instead of steel legs – went for $2,295 at auction. Panels of bright colors enlivened the utilitarian nature of Eames pieces, many of which were designed for offices and manufactured by the Herman Miller Furniture Company of Michigan. This tall storage cabinet – a variation of the usual model, with four sets of doors, ­was the top-selling single piece of furniture at the auction, fetching $18,750. 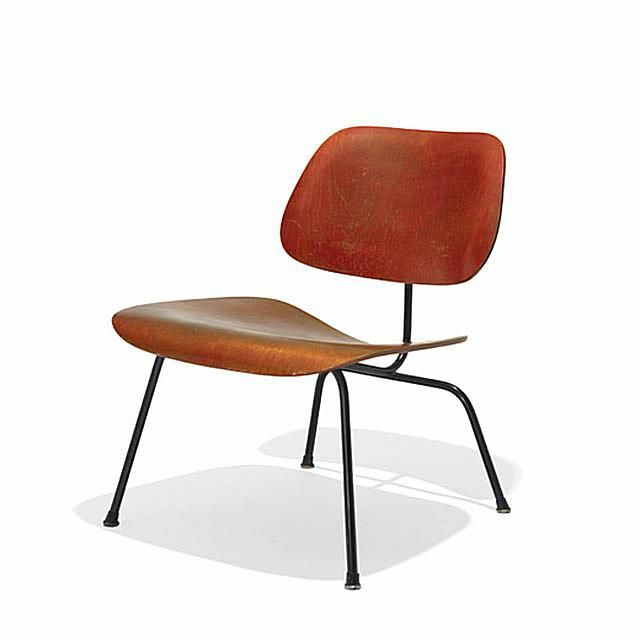 Though best-known for their chairs and storage units, the Eames designed a variety of furniture. This table, a prototype, displays their characteristic combination of wood (paldao plywood, in this case) and metal (zinc-plated steel). A fourth leg was added before the table went into production, so this rare specimen garnered $5,000 at auction.